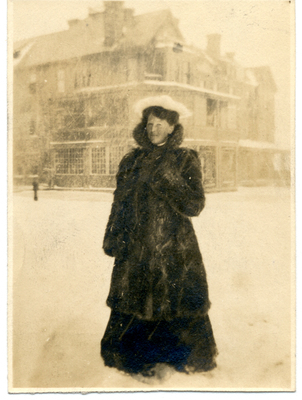 Lucy Rosalie (Lucja Rozalia) in a fur coat in front of a large house. "Lucy Rosalie (Lucja Rozalia) in a fur coat in front of a large house." Fronczak Family Photographs. Fronczak Collection. Archives & Special Collections Department, E. H. Butler Library, SUNY Buffalo State.